North Cornwall - What's on? Events in North Cornwall. This website is dedicated to promoting all that is North Cornwall. So if you are holding an event in North Cornwall then you can publicise it here absolutely free. If you have any deserving cause that serves to enhance any aspect of North Cornwall and needs a wider audience you can publicise it here absolutely free. If you do have an event or a deserving cause that you would like to publicise please e-mail us with your details and we will do the rest. All listings are free, the only stipulation is that it must be beneficial to North Cornwall. ’A Winter Gala’ of popular operatic arias and songs from films and shows. 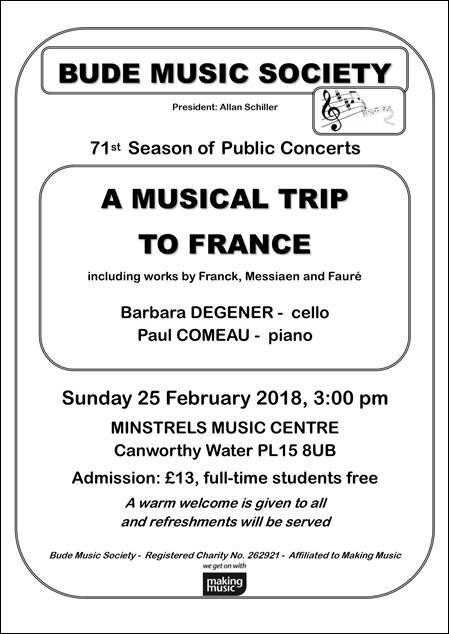 One of Britain’s finest baritones, Darren Jeffery, and mezzo-soprano Shelley Coulter-Smith will perform ’A Winter Gala’ on Sunday January 21st , 3pm, at Minstrels Music Centre, Canworthy Water (between Bude and Launceston), PL15 8UB. Darren Jeffery regularly sings leading operatic roles at Covent Garden, English National Opera, and Glyndbourne, and has appeared with several of the world’s top conductors and orchestras, including many appearances at BBC Proms. Shelley Coulter-Smith is also well known from her broadcast performances and her many operatic roles throughout Europe. Darren and Shelley will be accompanied by Anthony Seddon, an accomplished pianist with a strong association with music in Cornwall. Tickets cost £13 on the door, full-time students free. Further information at www.budemusicsociety.com or search for Bude Music Society on Facebook. St Piran's Day Big Breakfast in March at St Breward Football Club. North Cornwall's largest book event. This festival has made a speciality of English language performances of the Bach Passions whose intensity in the church’s intimate setting is a musical experience not to be missed. plus bric a brac and a range of tasty refreshments. Call or email for stall holder details. of Boscastle and its surrounding area. A week of walks with experienced and informed local guides, art sessions, social events, cream teas and dinners. The biggest day in Padstow's calendar. when Padstonians from all over the world return to their roots. Adult Education - Apprenticeships work for everyone. Small, friendly and very welcoming folk festival in the picturesque seaside town of Bude and nearby Stratton. Features a great range of sessions, dances and dancers and ‘sing-arounds’. Trebant Farm, Altarnun, PL15 7RR. 8 miles to the west of Launceston (Signposted just off the A30). Huge steam powered traction engines and displays of gleaming classic cars along with shire horses, traditional fairground attractions, trade stands and craft stalls. Kindred Spirits Festival is a two day music festival with two nights camping. Consisting of 3 stages: all under cover in our lovely marquees. There will be a good range of food vendors; stalls and shops to peruse; music, vocal and drum workshops; featuring Big Beat, junk percussion; a battle re-enactment group: saxons vs celts will be having skirmishes; archery lessons for beginners to intermediate level and much more still to be confirmed. Children's entertainment: bouncy castles, a giant inflatable slide, candy floss/popcorn, ice cream van, face-painting and henna tattoos. Also there will be organised games and art and craft sessions. There will be a well-being area: offering holistic healing, alternative therapies and massage, for those that want to be pampered. The fancy dress theme for the Sunday is Mad Hatters Tea Party with prizes for the best fancy dress and craziest hats. There will be a dedicated dance tent with a host of djs covering many genres to suit all tastes, with great light show and sound system. Two nights camping and day tickets are available. You are welcome to bring your campervan or caravan at no extra charge. Toilets and drinking water are available but no electric hook-ups or showers. For weekend camping tickets please go to www.kindredspiritsfestival.co.uk and buy tickets online. Usual Festival rules apply: No dogs and no glass, to see a full list of faqs and rules please visit Website. 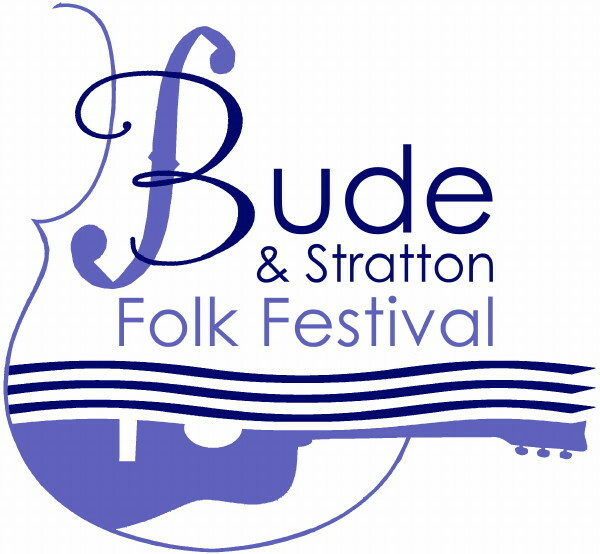 Bude and Stratton Folk Festival is a friendly mix of folk events held annually on the late May Bank Holiday weekend in this beautiful area of North Cornwall. It features music, song, dance, and storytelling, and there is a small programme of children’s events. The programme is published in April. The guest list includes Ange Hardy, Lukas Drinkwater, Jim Causley, Si Barron, Reg Meuross, Geoff Lakeman, Sam Kelly Trio, The Dambuskers, Thorn and Roses, Hamish Currie, Moe Keast. Season tickets are £50, early bookers and students get reduced prices, children are free. The Festival welcomes numerous talented guest performers, many internationally known, who give concerts and appear in other events during the festival. Local dance sides perform, and we are delighted to welcome children from local schools, who give a dance display on Saturday morning. There are concerts, sing-arounds, sessions, a folk club, a barn dance, open-mics, fringe events, storytelling, a folk service and workshops. The Rugby Club is the home for singers. There are sing-arounds, a Folk Club evening, short concerts, late night sings, workshops and informal gatherings. Children's events start with instruction in school leading to demonstration dances on Bark House Green. They are provided at no cost to schools or parents. St Michael’s Church has wonderful acoustics and hosts daily open-mic sessions. This is a great place to listen, for free, to the great talent the festival attracts and have a coffee and home-made cake or a light-bite lunch in support of church funds. There is a non-denominational folk service on Sunday. This friendly Festival has always had a “joining-in” ethos. We are grateful to the core of professional artists who do just that outside of their formal events. But we encourage everyone’s participation. There are workshops for musicians and singers of all abilities and a special concert on Monday showcases some of these. In other local venues free Fringe Events feature selected quality performers. The Festival offers weekend tickets and individual event tickets at very fair prices. Book on the website http://www.budefolkfest.com or call 07736 374003. Camping is available at the Rugby Club for weekend season ticket holders. Local campsites and accommodation can be found through Bude TIC. We are most grateful to our Festival Patron Jim Causley and all our guest performers, for the continuing support of Bude’s Town and County Councillors and Festival Friends. Thanks are also due to the Committee and staff of Bude Rugby Club and to the new owners of the Falcon Hotel for their commitment and encouragement. steam engines and classic cars. There’s also a variety of trade stands and a car boot sale. One of Cornwall's Best Family days out. Old Vintage vehicles and Steam Engines, Stationary Engines, Bikes, cars, Trade Stands and craft & Model tent. Entertainment this year includes, Musical Ruth from BGT, Xtreme Falconry, THE LAMB NATIONAL & Joseph Peace Stunt Show. Entertainment for the children all weekend from bubble ology to clowns and magicians. The countryside corner this year, with not only our usual animal exhibits but New for 2019 The Rural Crafts marquee, & Padstow Flower Show. The Dog and duck display, Wild fowling display, long netting, Shire horses and much more will also return in our country side arena. There will be static displays and demonstrations from, chainsaw artists, willow weavers and Blacksmiths. There will be Shire horses, Donkey Rides and a traditional fair with a beautiful set of steam powered gallopers, with Musical entertainment all 3 days in our beer tent and Restaurant. Camping available for the weekend please see our website for more info. Rock Oyster Festival is a boutique food, music and arts festival held at Dinham House on the Camel Estuary near Rock, North Cornwall. Cornwall YFC's 'It's A Knockout' & Summer Do! St Tudy village on July 2019 from 5:30pm at the playing field. Box office: 01208 265211 or 01208 265276. The Tintagel Orpheus Male Voice Choir. Kilkhampton, 5 miles north of Bude, on the A39. These events are expected to draw a big crowd of spectators who will then remain on site to enjoy the evening’s musical entertainment which is provided by a host of local acts and bands. This event is being organised by The Christians Together in Bude and Stratton. There will be a fancy dress competition for adults and children on the theme of "Film Characters". Lots of fun things to do, including Splat the Rat, Cake and Squash, Fishing Game, Bouncy Castle, Children's Races, Face Painting, Quizzes and Competitions, Story-telling, Live Music, Hot Dogs, and much more besides. E-mail: Jackie Adams for more details. This highly regarded annual show is a colourful mix of agriculture, crafts, local produce, displays and stands, bringing the local community together to welcome visitors to this rural area of Cornwall. Launceston Show is a wonderful, vibrant day out for all the family to experience and enjoy. A varied selection of entertainment goes on during the day in the Theatre Marquee and in the main ring during the afternoon. Easily accessed from the A30 at Kennards House, west of Launceston. Free parking. Refreshments available. The Leopallooza Festival is now one of the highlights of the Cornish summer and celebrates its 12th edition in 2019. The festival has grown form a small party with a burning car to a popular, well-regarded new music festival (with a burning car) with 6 stages. such is the growing, credible reputation of Leopallooza amongst burgeoning artists and reputable agents. It all kicks off on Friday 5pm with an evening of live music, BBQ, hog roast, great ales and a golf roll up competition open to all who would like to participate. Saturday kicks off with an early shotgun golf competition (fully booked) – followed by an afternoon of children’s entertainment, more great food and live music. Some of the popular bands from last year have confirmed they are returning and of course there will be some great new bands to entertain you. Come and enjoy some summer sunshine, family entertainment and a great weekend. Padstow celebrate carnival week in style with activities, quiz, music and more. Fun for all! 4:00PM - Queen of Queens Competition. 7:00pm – GRAND CARNIVAL PARADE. The annual celebration will take place as usual at town’s most significant building The Bude Castle, constructed by 19th Century Cornish inventor, Sir Goldsworthy Gurney and alongside the Bude Canal, famous for its series of incline planes and working sea lock. Horticulture section with a Food Hall. YFC Competition and a field full of trade stands. on the day is donated to local charities and organisations. Afternoon events are held in The Castle Grounds. The North Cornwall Cup Youth Football Event. at Budehaven fields in Bude. The NCC will be held this year once again at Budehaven fields for all ages from U8 to U18 and also Girls at U16. The event attracts teams from all over the south west plus teams from even further afield. For event details please visit www.rswsc.co.uk . A fun day for all the family with Bude lifeboat crew, rowing races, sand & culm races, coffees, cream teas, music and singing, treasure hunt, crab catching competition, helicopter demo, hog toast, ladies guild stalls, sea safety caravan, beach rescue, disco, live band, even stormy stan could be there! and of course finishing with a firework finale. On Bank Holiday Monday, there will be lots to see and do, starting from 10am, finishing with a grand Firework Display, which starts at 9.30pm. Please come along and join us for a real fun family day out! Tel: 01288 356360 for more info. The annual event features not only a packed programme of traditional jazz and swing workshops, but also New Orleans-style street parades. The line-up is truly international and many acts return year after year to play. The venues include pubs, hotels, small halls and restaurants - comfortable and informal surroundings that help to create a friendly and relaxed atmosphere. Bude is the small and unspoilt seaside town in Cornwall hosts to one of Britain’s leading jazz festivals. Two days of schools’ events followed by a wonderful weekend of talks,workshops , exhobitions and performances. Authors include Anne Enright, Joanna Trollope, Patrick Gale and Nina Stibbe. More information and tickets from www.ncornbookfest.org. or from the Wadebridge Bookshop. Accompanied under 16s free to most events – please check the website. pianistic sparring partner James McConnel. No foible of modern life will go unmocked. themes from Eastern Europe, Irish traditions and urban alienation. A traditional Carnival usually held on the last Saturday in October. Tintagel Football ground - Music, fun & refreshments . T.B.C. BODMIN annual bonfire, laser show and grand fireworks display at the Priory Park football field from 6pm. Children's rides and hot dogs will also be available. Tickets £4 for adults and £3 for children on the gates. The under 5s get in free. For more info contact Bodmin Visitor Centre. THE Well Parc Hotel, Trevone, annual bonfire and fireworks party. The bonfire will be lit at 6.30pm with fireworks at 7.30pm. For more information, contact 01841 520318. WADEBRIDGE Young Farmers' Club holds a annual bonfire and fireworks. This year for more information, please ring Emma Sleep on 07545 612092. WADBRIDGE Camels RFC are holding a bonfire on Saturday the 3rd of November from 6pm onwards. The event will take place at Port Gaverne. The bonfire will be lit at 7pm followed by fireworks at 7.15pm. Remember, remember the fifth of November…be dazzled this Guy Fawkes Night by Cornwall’s most fantastic free display, the Ginsters Fireworks Spectacular! This fun family event will be held at Callington Community College with doors opening at 5.30pm and the fireworks lighting the sky at 8.00pm. There will be entertainment such as live music and Pirate FM, along with plenty to eat including hot pasties and a Hog Roast. The Afro-Celtic dance band celebrate 25 years of groundbreaking music. The band uses the rhythms of the Baka people of the Cameroon rain forest to fuse their Celtic and African roots. A highly infectious and joyous celebration. £12. Standing event. Dale takes us on a musical journey showcasing the legendary piano players of New Orleans. The Cornish Winter Fair 2019. It's a free event, held entirely under cover here within the Exhibition Halls at the Royal Cornwall Events Centre, Wadebridge. There's plenty of free parking on site. The event runs from 10am until 5pm. There will be plenty of farm animals that you can get up close to, an food and farming educational discovery zone where you can learn more about local agriculture and food production. There will be opportunity to 'Have a Go' at things like milking a (mock!) cow and grooming a pony. It'll be great fun for all of the family. It'll be a great place to kick off your Christmas shopping. With an array of Cornish food and drink producers on hand to show you how they create their quality products, with chance to try and buy their delicacies. There will also be craft stalls selling fantastic locally created gifts. There'll be pop-up cafe selling food and drink as well. The event incorporates the Wadebridge Prime Stock Show, which has been running for 137 years. It's all about competitions. The packed prize schedule includes cattle and sheep showing, produce, craft and cookery classes. There are competitive classes for children, local schools, WI and Young Farmers' Clubs. Entry is completely FREE of charge and we've got acres of free parking on site as well. The event is totally undercover - so it'll be great for all the family, no matter what the weather. at Treglos Hotel, Constantine Bay. Usually both take place on the first Saturday in December. come alive with celebrity chefs, culinary delights and festive fun. *Disclaimer. Kestrel reserve the right to post events that benefit North Cornwall directly or indirectly. North Cornwall Village Events Pages. No reciprocal link is required but would be appreciated. If you are holding an event in North Cornwall then you can publicise it here absolutely free. If you have any deserving cause that serves to enhance any aspect of North Cornwall and needs a wider audience you can publicise it here absolutely free. If you do have an event or a deserving cause that you would like to publicise please e-mail us with your details and we will do the rest. All listings are free, the only stipulation is that it must be beneficial to North Cornwall. Copyright © 1998-2019 Kestrel Promotion/ Kestrel Solutions All Rights Reserved.